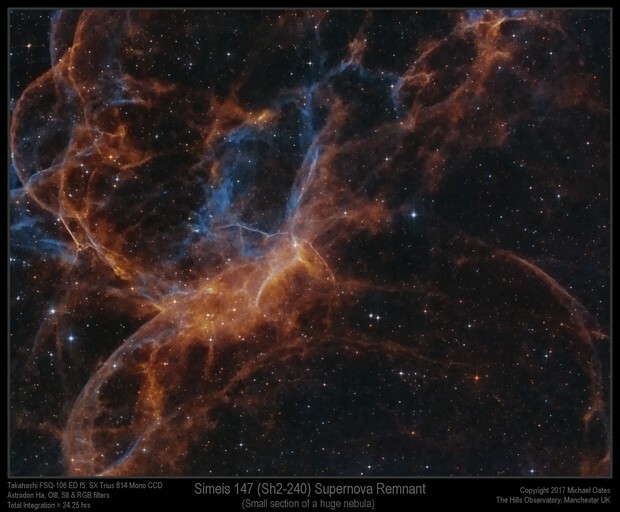 Simeis 147, also known as the Spaghetti Nebula, SNR G180.0-01.7 or Sharpless 2-240, is a supernova remnant in the Milky Way, straddling the border between the constellations Auriga and Taurus. This image is a small section of the nebula, in fact it is panel 10 of a 16 panel mosaic that I started recently. Due to the rather long integration times for each panel, this mosaic will be considered a very long term project! Narrow band images processed as tone maps with RGB stars added after. Most of the processing is done in PixInsight and finished off in Photoshop.